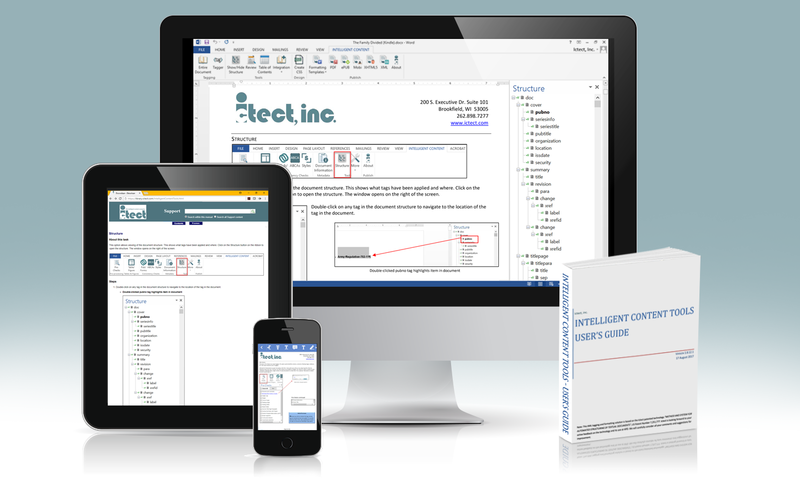 Ictect offers patented software for authoring and converting content to DITA. Technical documentation departments will save time and significantly reduce cost by utilizing Intelligent Content Tools from Ictect. 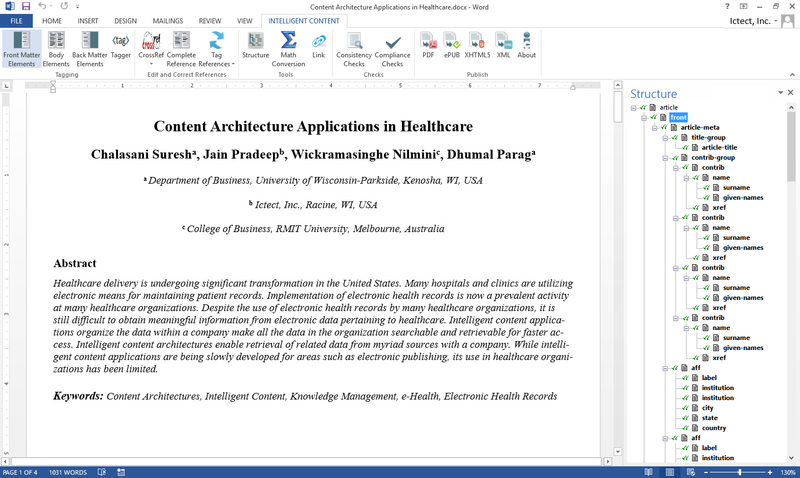 With Intelligent Content Tools (icTools), authors can easily prepare their documents in Microsoft Word without having to worry about XML. icTools does the tagging! 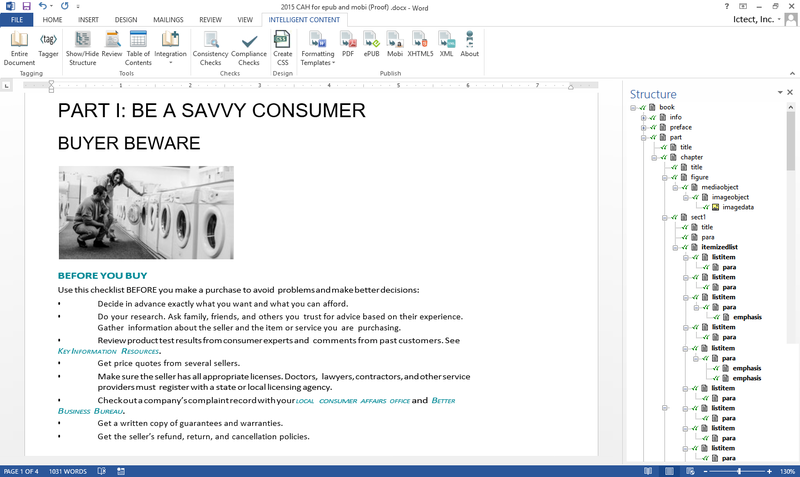 Easy to use interface for SMEs, engineers, non-technical and technical writers. 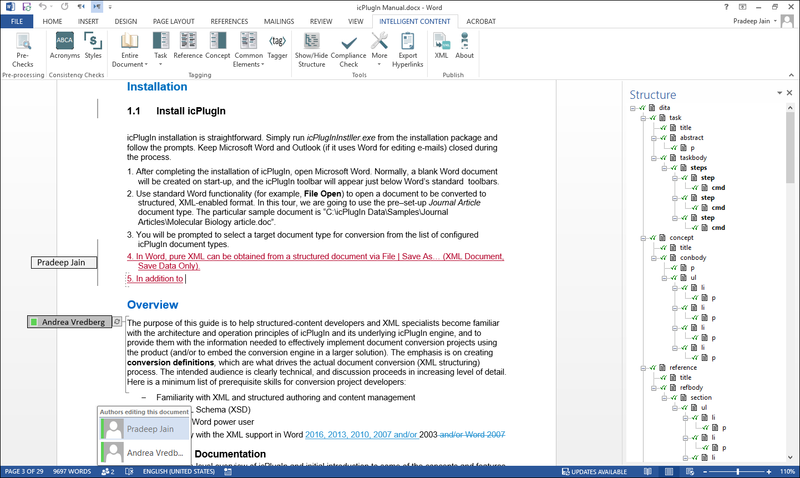 Authors will still have access to full functionality of Microsoft Word with icTools. No need to worry about XML! With icTools, you can simply “click and tag”. 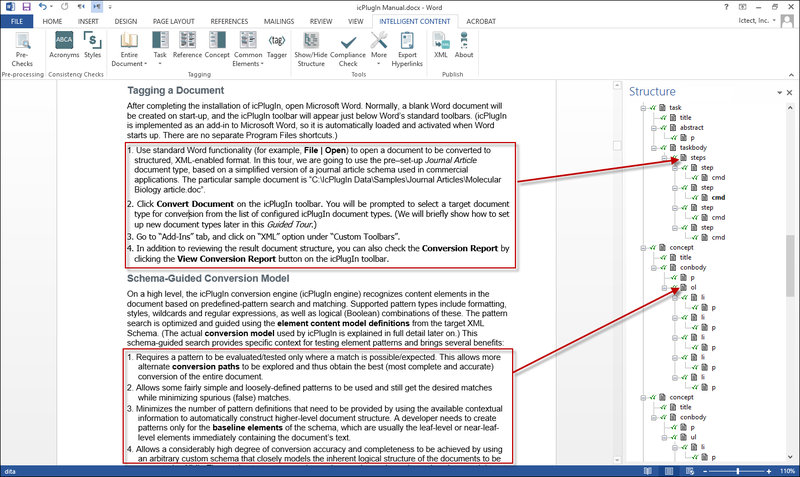 Users can choose to tag the entire document or individual sections of the document. 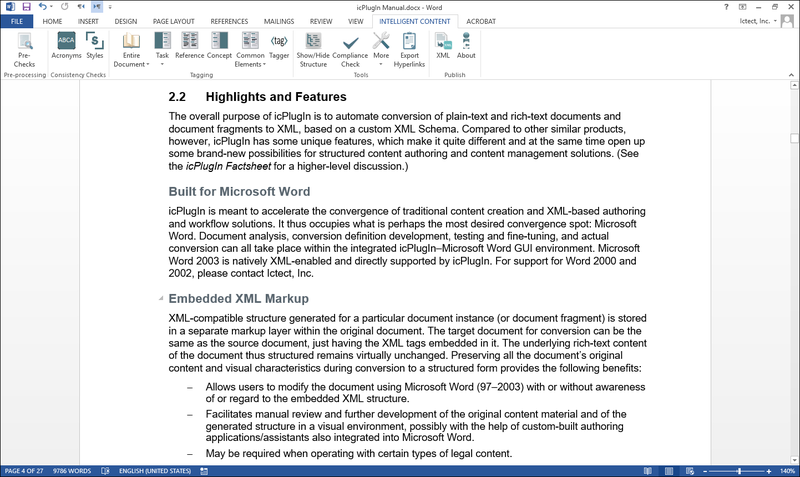 While most of the editing can be done without seeing XML tags, icTools does offer the option for users to fully edit XML tags in Word. 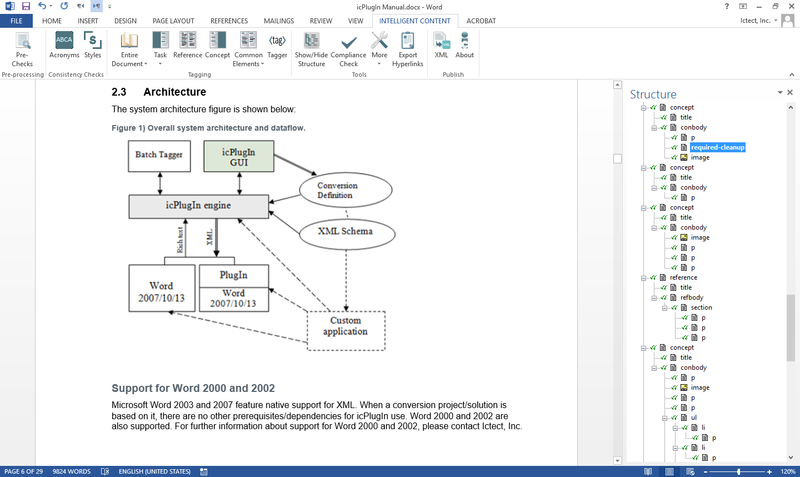 icTools provides on-the-fly validation against DITA schema. Users can choose to run validation at any time. Effective controls are available to ensure that only valid documents are checked-in the CMS. 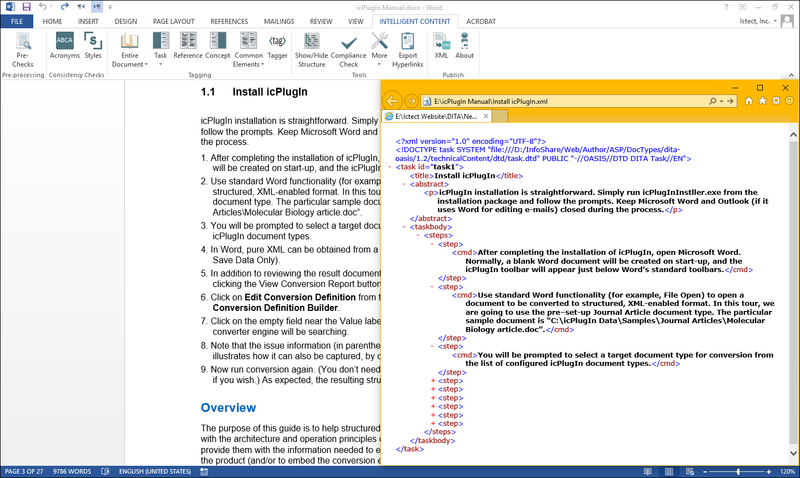 icTools is the only product that allows track changes and XML to be used at the same time in Microsoft Word. Technical Writers and Subject Matter Experts can communicate with track changes without worrying about the XML within the document. 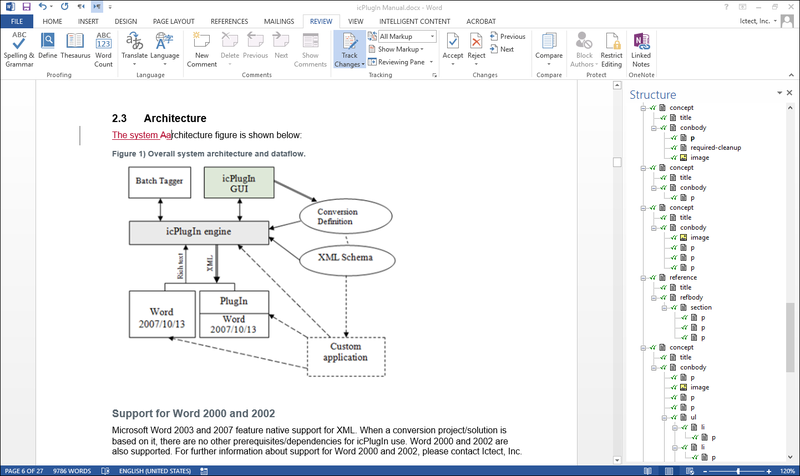 icTools supports the ability to round-trip from Word to DITA and DITA to Word at any stage in the workflow. 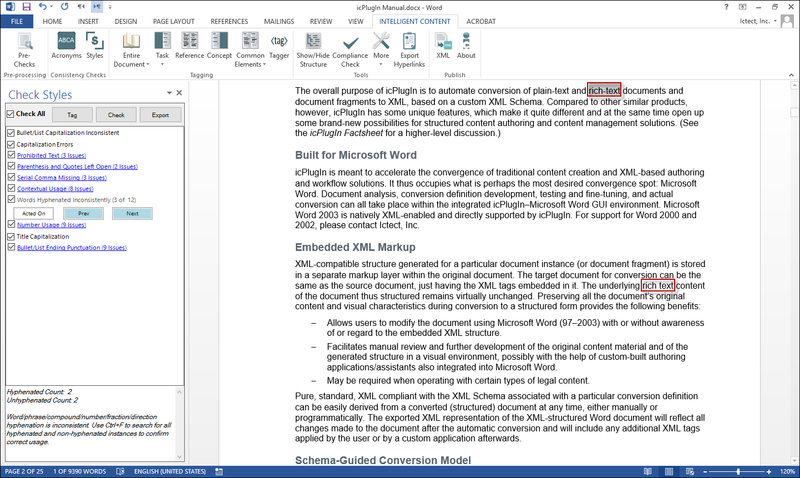 DITA to Word automatically styles the content with your company’s template styles. icTools can convert documents from various formats to DITA. We offer this for in-house use or as an outsourced service. icTools can convert from many formats including common formats such as RTF, Word, InDesign, and PDF by importing into Word. icTools also includes pre-checks and clean-up to improve the conversion process. 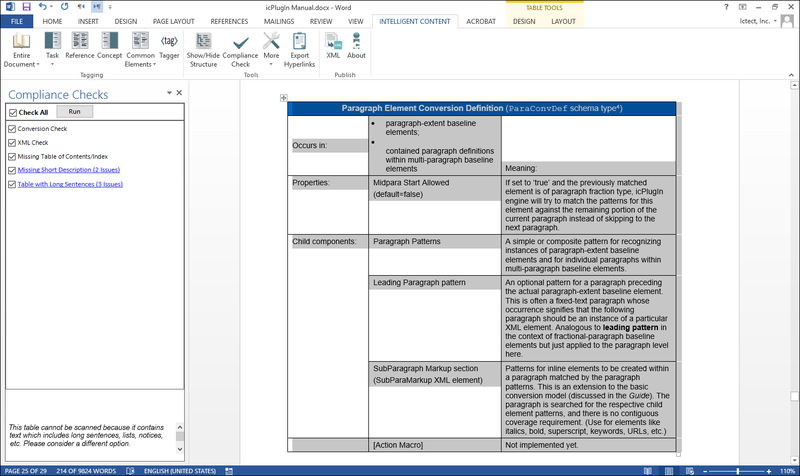 Ictect’s patented schema-guided method allows for differentiating based on context. 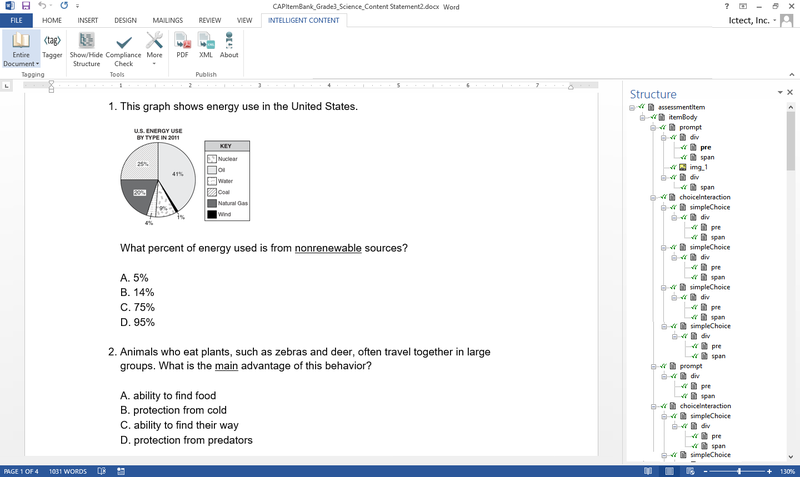 For example, "steps" in a task and "ordered list" in a concept topic. 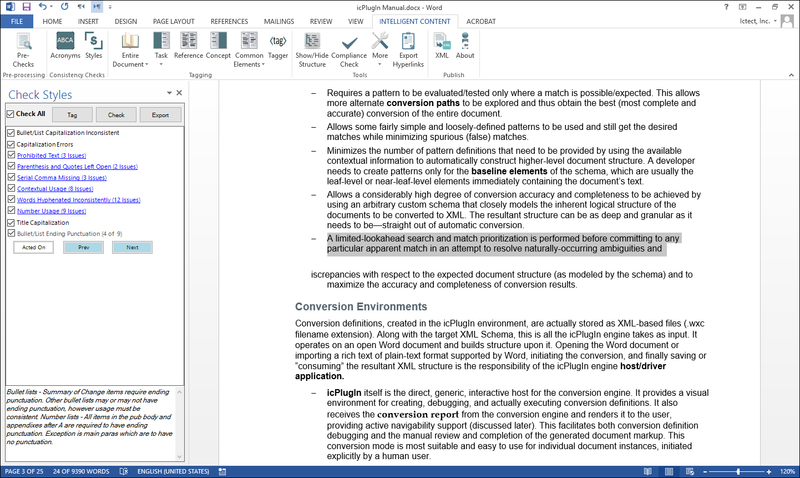 Ictect offers a tool for DITA Administrators and power-users to easily edit conversion rules. Conversion rules include Regular Expressions, Word Styles, Font Formatting and Text Patterns. Ictect also offers training to conversion developers. 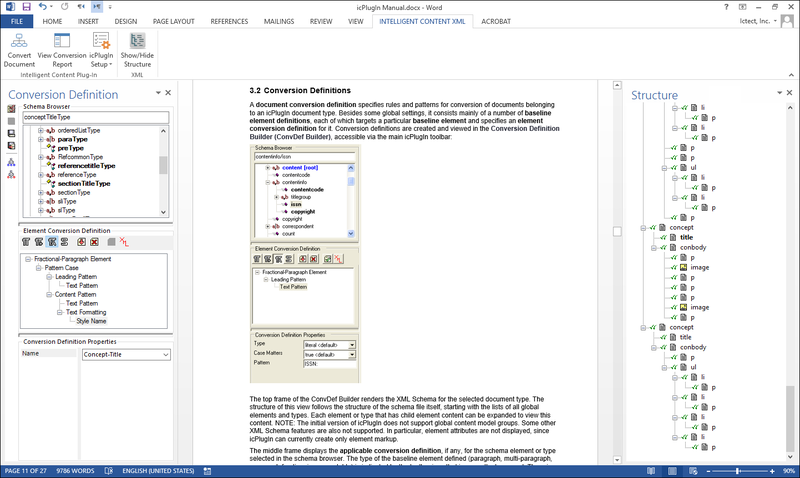 icTools uses your schema, and the conversion rules are mapped to support DITA extensions. Ictect offers the software for use by your staff for ongoing conversion, as well as conversion as a service. 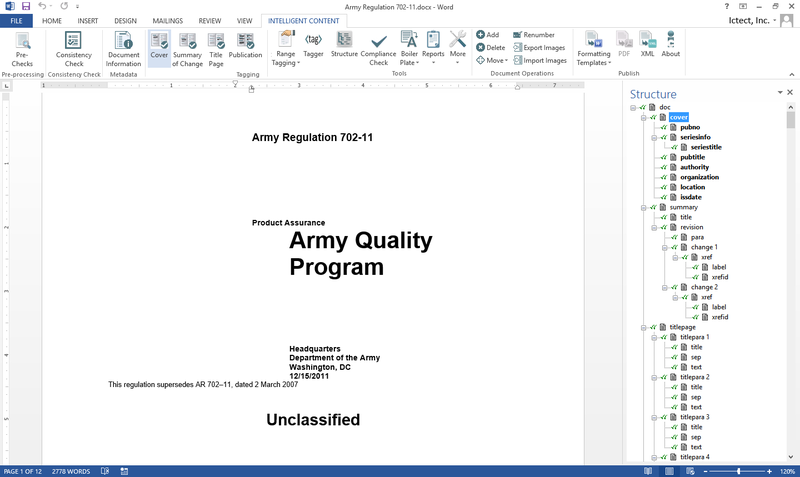 Compares your documents against your house and DITA style guides, identifies errors and compliance issues, and provides point-by-point feedback for making corrections. icTools checks for consistent use of acronyms, hyphens, dashes, contractions, capitalization, etc. 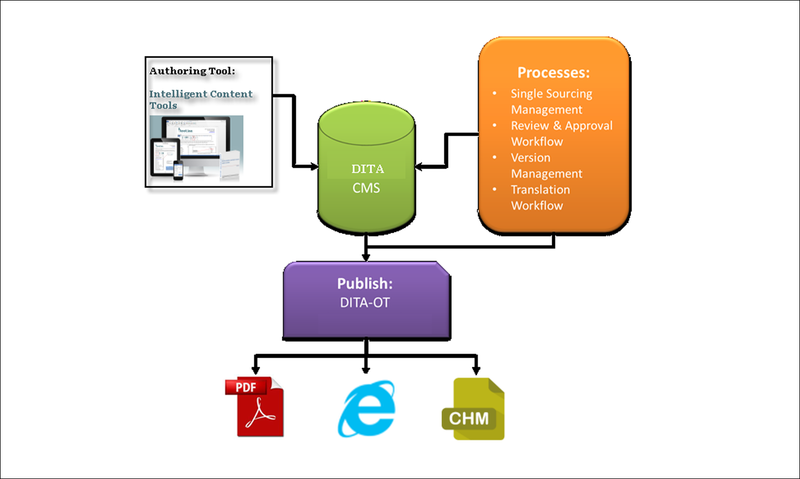 icTools is key to bringing "Intelligent Content in the Enterprise". 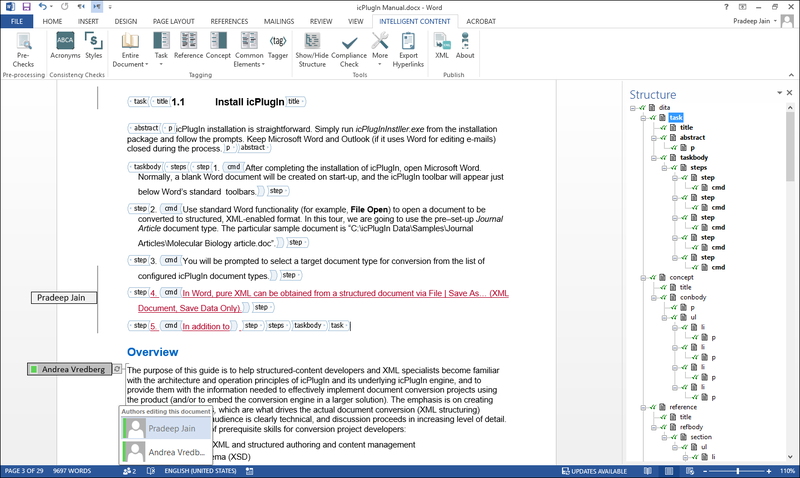 As it is Word-based, it integrates with any enterprise system. As it offers DITA-compliant XML, it integrates with any DITA system. icTools integrates with Structured, Component, Content and Document Management Systems. Current production environments include SDL/Trisoft, Content@, Documentum and SharePoint Systems. 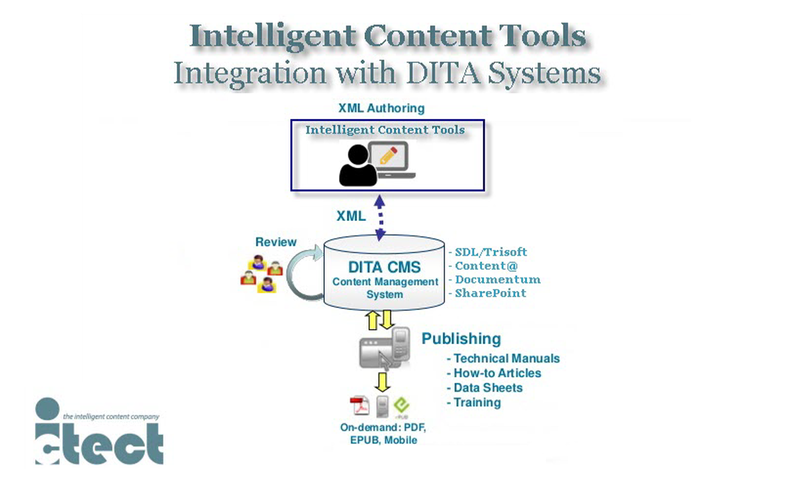 icTools delivers DITA compliant XML and integrates with DOT and other DITA-based systems. 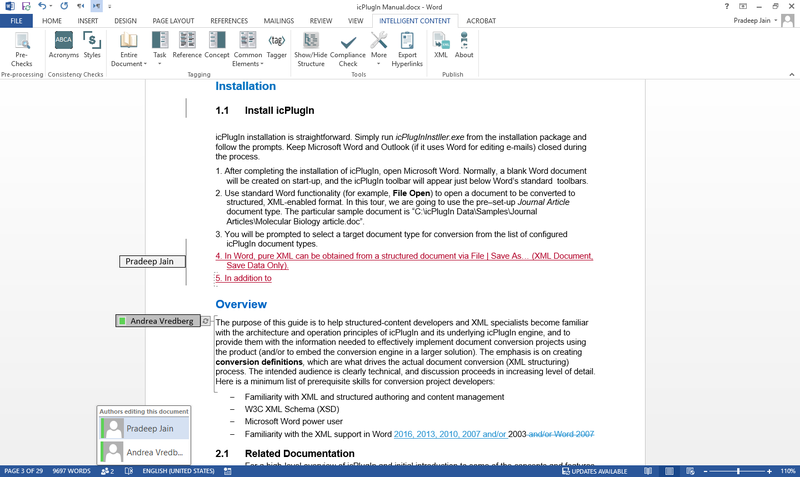 Ictect is the only company with a patented XML plug-in for Microsoft Word. 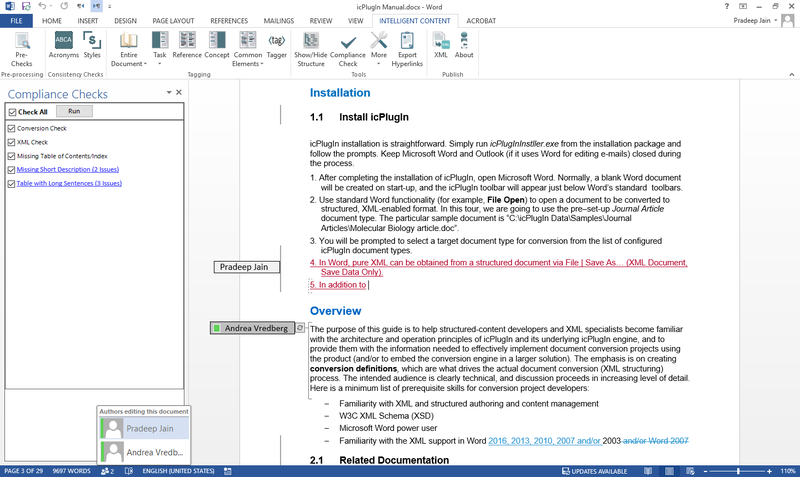 While other editors claim to offer Word-like features, icTools is the only one used within Microsoft Word. Organizations can leverage their investment in Microsoft licensing and reduce training costs. icTools can be customized for content editors, SMEs, production editors, and authors. 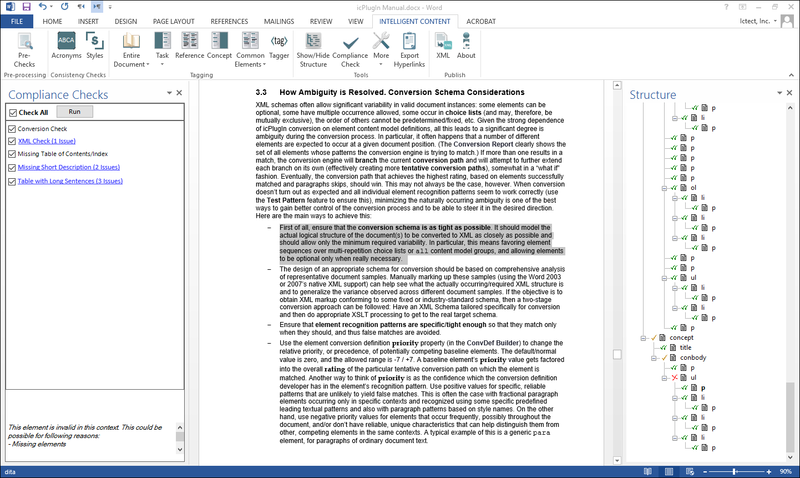 Everyone can participate in the creation of standardized, structured documents. 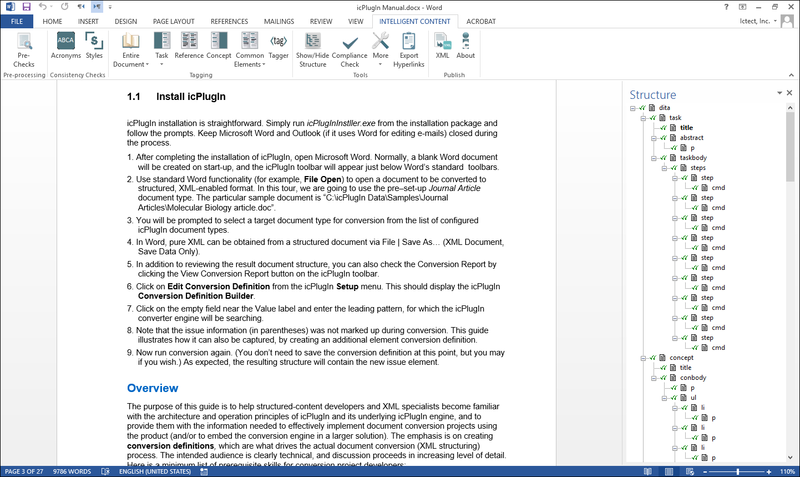 Enhances Office 365 and SharePoint’s collaboration functionality with managed co-authoring and editing. 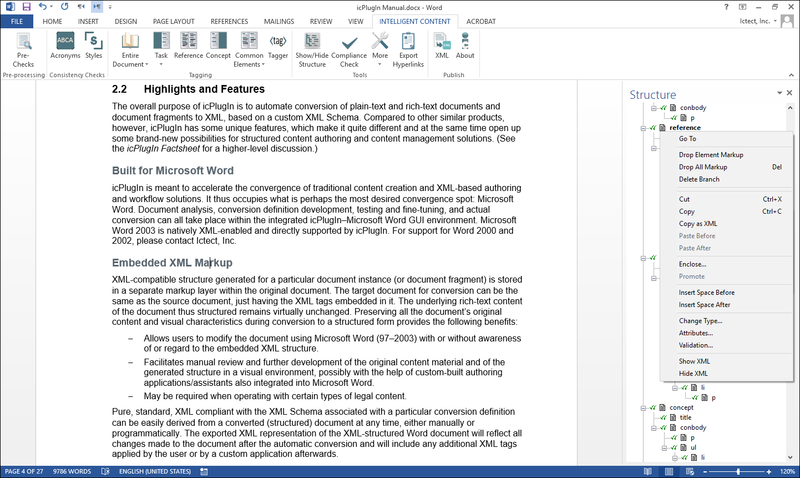 Enables parallel authoring, editorial, and production workflows. 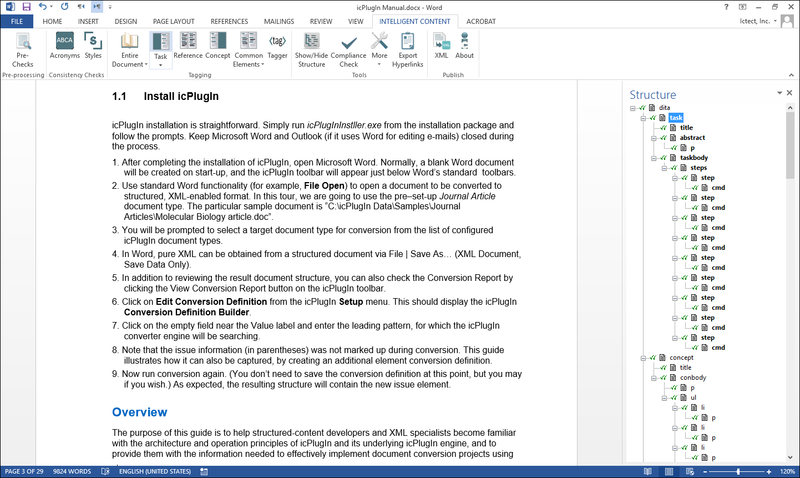 icTools is the only software that offers seamless co-authoring/co-editing with Office 365 in an XML workflow. 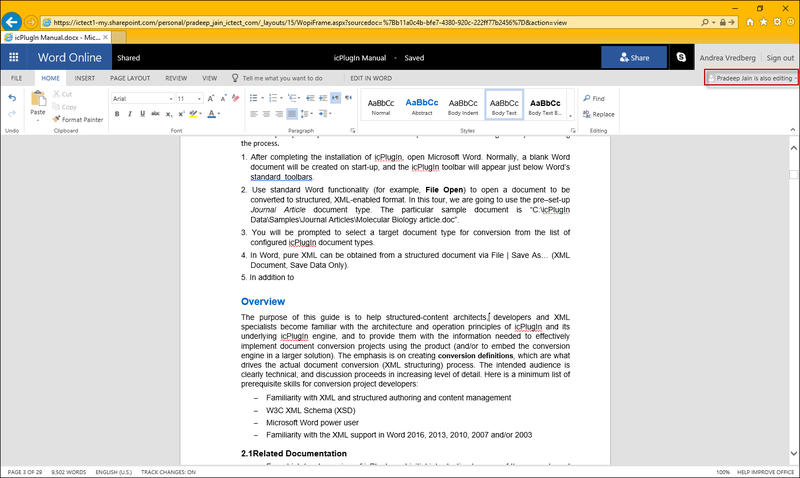 Authors, editors, reviewers, proofreaders, and others can edit the document at the same time and use track changes with XML! 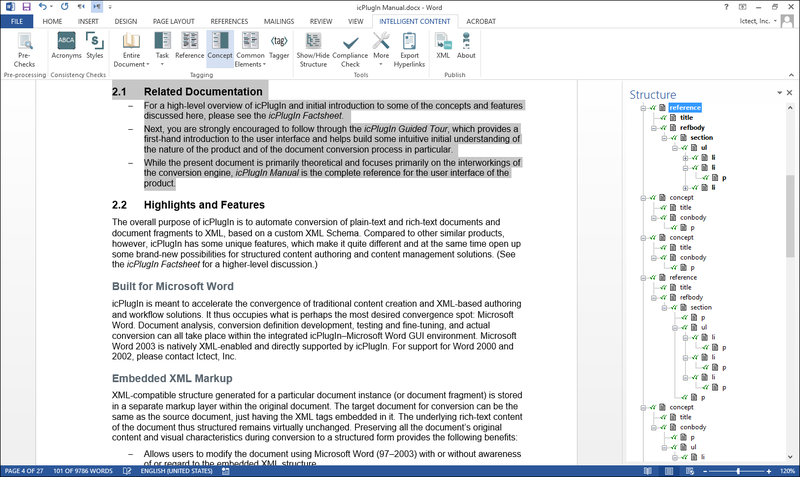 With Word 2013/2016 and Office 365, document co-authoring can be done from the desktop or web interface.